Look Park has a number of spaces available for event rental. Planning a birthday party, fundraiser, company picnic, or community barbecue? 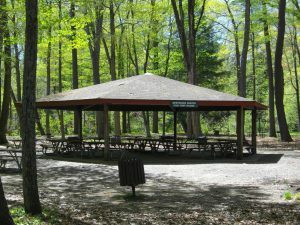 Look no further than Look Park’s beautiful pavilions and picnic areas. Please note: in order to book a space, payment is due in full at the time of your reservation. Duck Brook is in the wooded Westwood section of the park. Duck Brook is set back from the river and sheltered on two sides by Duck Brook and a small dike. Restrooms and a volleyball court are located in this section, and parking is close by. This space offers one double grill and electrical outlet. *Does not include vehicle entry fees. Additional $25 fee to allow alcohol at pavilions. 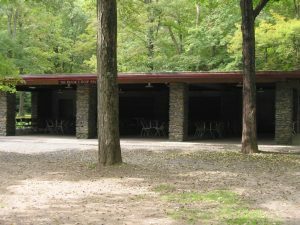 The park’s second largest pavilion is a hexagon in the middle of the wooded Westwood section, next to a volleyball court. Restrooms are nearby. A covered bridge leads to Potato Island and the Park Grill within easy walking distance. This space offers two double grills and electrical outlet. 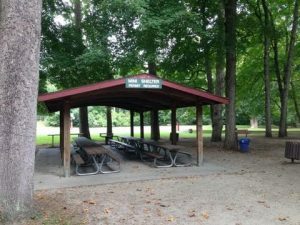 Look Park’s newest shelter is ideal for groups with small children. The pavilion is in the heart of the water spray area, three large playground structures and swings. Basketball and volleyball courts are close by, as are restrooms and the Park Grill. This space offers one double grill. Halfway around the park, the Willow Brook is a few steps from parking, yet a tall hedge of evergreens makes it the most secluded of the park pavilions. Across the road, pedal boats are available for a cruise around Willow Lake. This space offers one double grill and electrical outlet. A few steps from the Mill River, the pavilion is at the back of the playground, offering more privacy than the Mini Shelter. It’s within easy walking distance of the water spray and playground equipment. This space offers two double grills and electrical outlet for small appliances. Look Park’s largest pavilion is popular for large groups and catered events, often booked a year in advance. A food prep area features one refrigerator with freezer and counter space. There is a small bar area and three double grills. This is the only pavilion where a DJ is allowed. Restrooms, a volleyball court and toddler playground are located nearby. The Dow is on the quiet side of the park. HOW DO I GET A RESERVATION? Look Park is a great place for a picnic, however permits are required. 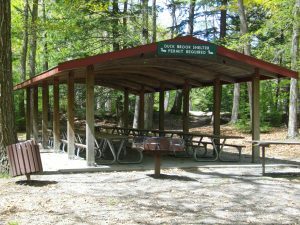 Permits may be obtained at the Park Office in person, by phone at 413-584-5457 or online at www.lookparkma.myrec.com. Advance reservations are recommended but may be made the same day. Best chance for availability is planning in advance, especially for weekends and holidays. Payment is required when reservations are made (check, cash, credit or debits cards are accepted). See Look Park Picnic Site Map for locations. WHAT COMES WITH A TABLE? All picnic sites have charcoal grills for use and the site is yours for the full calendar day. You do have to provide your own charcoal and matches. 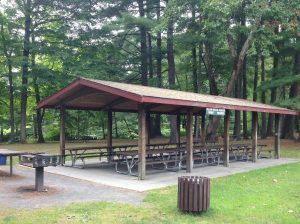 We request that picnickers comply with the City of Northampton’s mandatory recycling effort. All cans, bottles, and plastic jugs must be removed from picnic trash and taken home or placed in receptacles as provided. If you choose to have alcohol at your picnic there is an additional $15.00 charge per reservation. Please no kegs or glass bottles. WHAT IF I ONLY WANT ONE TABLE IN A GROUP SITE? 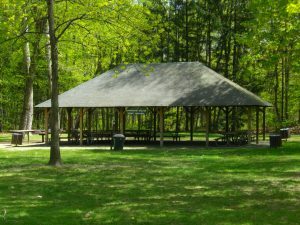 Group sites are reserved for picnics with a larger number of people. For example, site 2 has tables A-D, if you want table 2A and 2B you are required to purchase 2C and 2D as well. We do this to accommodate larger crowds. Please be aware when you are renting part of a group site (Examples; site 2A-D, 8A-D, Club Area, etc) that you may be required to share grills with other parties in the same site. When renting a site which has 2 tables at it you are required to pay for all the tables on that site. CAN I USE MY PICNIC VOUCHER FOR A TABLE? Yes, you may use one picnic voucher per transaction. We do not allow multiple picnic vouchers to cover multiple tables in one transaction. You may use your one picnic voucher on one table and pay for the others if you decide to purchase more than one table. Plan your next event at the Look Park Garden House! The Garden House stands on the site of the former Look Park pool building, a nostalgic Northampton landmark built in 1930. The building was restored to its current Mission Style in 1999 and has since become the area’s premier banquet facility. The interior speaks of simple elegance, featuring a large stone fireplace and mahogany paneled walls decorated with hand-crafted botanical stencils. The enclosed sunporch offers a lovely view of some of the park’s many attractions and is accented with tasteful wrought iron accessories, opalesque wall sconces, and awnings reminiscent of earlier days at the pool building.